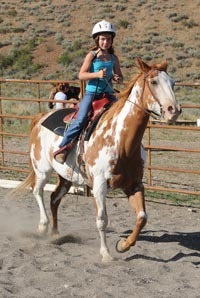 Before this summer, only 12 of the 64 children in the Two Hearts North Horsemanship Program in Hailey had any sort of experience with handling horses. Now, they are near-experts at saddling, watering, cleaning and taking the horses around the ring—the older children and teens riding full-sized horses or the 6- and 7-year-olds walking miniatures on a lead. "Our kids didn't even know how to catch a horse," said Amy Federko, program coordinator and member of the Blaine County Fair Board. "Just going out in the field with a halter and getting them to the barn [was difficult]." The Two Hearts North program, part of Blaine County 4-H, started last year when Federko realized that 4-H needed to expand into the north valley and boost membership in order to survive. Programs such as sewing, gardening and biking already exist in 4-H and could appeal to kids in Hailey and Ketchum. Blaine County 4-H Program Coordinator Kathi Kimball said horses have a certain appeal as well—so much so that the program expanded total 4-H membership by an estimated 40 percent. "Everyone loves horses," she said. "Horses are a great way to enjoy our landscape, to go outside and do great things." So Federko hatched a plan for a "horse rental" program in which kids from across the valley could lease a horse for the season, taking care of it as though it was their own for two days a week. She partnered with Cindy Jones, program director for Two Hearts Horsemanship at the Sunshine Acres Children's Home in Mesa, Ariz. The program lent Federko and 4-H nine horses and a few miniature horses, and paid to transport them to and from Arizona. The horses, along with a few donated by local friends of the program, were boarded all season at the Heatherlands Horsemanship Facility just south of East Fork Road. Care and keeping of the horses, as well as scholarships for children who could not afford the program's $300 fee, was provided by funding from the 4-H Leaders Council, the Deer Creek Foundation and the Campfire Foundation. Federko estimates that the students received more than $1,600 in scholarships. "We didn't turn anyone away because of financial difficulty," she said. Federko said the donations, as well as the 14 tons of hay donated by local ranchers, have made the kids truly grateful for the opportunity to participate in the program. "You don't see them wasting any hay, because they know how grateful we were to have ranchers donate hay to us," she said. Once a week, children from ages 6-18 catch, halter and groom their horses, clean the horses' hooves, saddle and bridle them, ride them and then brush, rinse, squeegee and feed them. All students must keep a log book that outlines their goals in the program—such as learning to ride or listening well to instructors—as well as the animals' health records and a list of expenses related to the animals' care. Students who compete in the fair—which includes all 64 students this year—also must give a demonstration, which is a speech, a practical demonstration or an illustrated talk on a subject related to the program. Kimball said topics include horse breeds and types and horse health. Students must present to their club before they can compete at the fair and possibly go on to district or state competitions. Despite these responsibilities, which take up two evenings a week for the program's participants, Federko and Kimball said the program has been wildly successful. "Almost every meeting Two Hearts North has, the following day I will get two or three emails from parents just thrilled about what [the kids] did," she said. "[The kids] could hardly wait to go to class, and if they were ever going to miss, they were very disappointed." Kasey Johnson, an 11-year-old club member, said Two Hearts North was her first experience with horses—which she never thought she'd be able to ride. "Since I was young, I've been afraid of horses because they're so big," she said. "Cindy [Jones] helped me with my confidence." Federko said she hopes to see the project expand next year, but will need more horses to increase the number of students. "We just had no idea we would be so hugely successful," she said. "We'll maybe not just have it in the evenings, but do some weeklong programs for kids so they would have a better opportunity to improve." She said she also hopes to start earlier in the spring and go later in the fall. Those who want to see the Two Hearts North students in action can stop by the Blaine County Fairgrounds in Carey on Friday and Saturday, when the kids will be competing in a two-day horse show designed to show off their skills. Federko said the students will mostly be competing in showmanship, barrel and poles, though roughly a dozen will compete in more difficult events such as reigning. The fair is a great chance for the kids in the north valley to connect with the rest of the county's 4-H clubs, she added. Two Hearts North will run the fair's petting zoo, help decorate the 4-H exhibit building and make meals for the club. "It's a lot more than riding a horse," she said. "It's getting them to be a part of the community." For more information on the Blaine County Fair schedule of events, visit http://blainecountyfair.com. Express photographer Willy Cook contributed reporting to this story. The 4-H Market Animal Auction will be missing one high bidder this year. Ketchum resident and long-time 4-H supporter Jim Cimino passed away Monday morning at the age of 92. Cimino typically purchased 4-H animals at high market prices, then donated the animal back to the child, who could then resell it and put the money toward college. "Jim Cimino's decades-long, multigenerational contribution to the families of 4-H is unparalleled," said County Commissioner Larry Schoen, adding that the philanthropist may be honored at this year's fair. Cimino estimated in an interview in 2010 that he spent more than $50,000 a year on 4-H animals.